As I help plan the first-ever Korean American LGBTQ Seminar for family members, allies and the broader immigrant community, I cannot help but wonder: which moment was it that enabled me to become the loud and proud mother of a bisexual, transgender son that I am today? Was it when my child, at the tender age of fourteen, declared in an angry burst that he was a boy? In that moment, my husband and I felt confused, afraid and angry. Was it when I started frantically searching for words to describe LGBTQ terminology in Korean so that I could talk to extended family about my son's new name and gender pronouns? I remember feeling frustrated and depressed about the lack of resources available. Was it when I discovered the Dari Project's bilingual anthology of LGBTQ stories, giving me a glimpse of the barriers that Korean American LGBTQ people face in their everyday lives? Was it when I felt heartbroken to hear of LGBTQ youths in Korea who run away from their abusive homes and schools, and of the struggles to build safe spaces to house and protect them? Was it when I met Joanne Lee, a Korean American mom from Madison who lost her 16-year-old transgender son to depression? After her son Skylar's death, Joanne started touring U.S. cities to share his story and speak about the importance of family acceptance. Was it when I started sobbing uncontrollably on the bus back home from Philadelphia, where I had spent a beautiful weekend with my son attending the Trans Health Conference? I had just read his Facebook post on the Orlando tragedy. He spoke of how, for the first time in his life, he felt afraid. Even so, he vowed to fight back as part of the queer community. I felt helpless as a parent, because I fully realized in that moment that I couldn't always protect my son, and that this world is still not safe for him and others in the LGBTQ community. The Korean American and Asian Pacific Islander communities in general have a difficult time accepting their LGBTQ children and family members. When they discover that their child is LGBTQ, family members -- particularly parents -- are thrown into a state of guilt, shame and fear; they are worried about the future success of their child in a world that is not always kind, accepting or safe. They are worried about what their relatives and what other, often religious members of their immigrant community will think. And so they try to convince their child to make a different "choice." They can respond with anger, and they can become depressed themselves. Families default to silence, because it feels easier to avoid the subject than to figure out how to actively support an LGBTQ child. It doesn't help that Korean culture specifically, along with the network of Korean American church communities throughout the U.S., sometimes promote homophobic and transphobic beliefs. But we're making progress. This summer, supportive parents in Korea gave out free hugs to LGBTQ individuals at the Queer Culture Festival in Korea. Last month, Joanne Lee and her family announced the creation of the Skylar Lee Leadership and Activism Award, which commemorates Skylar's life and commitment to the LGBTQ community. A dozen or so parents have also formed a support network under the banner of "KARP" -- Korean American Rainbow Parents -- which aims to spread understanding of LGBTQ issues within the Korean American community. On October 15, KARP is putting on a one-day event to bring parents together, so we can build community with one another by sharing stories and asking the personal -- and sometimes painful -- questions that we all have as parents of LGBTQ children. This is our way of letting the Korean American community know that YES we exist as supportive parents, and YES we stand up for our LGBTQ children, in public and in private. 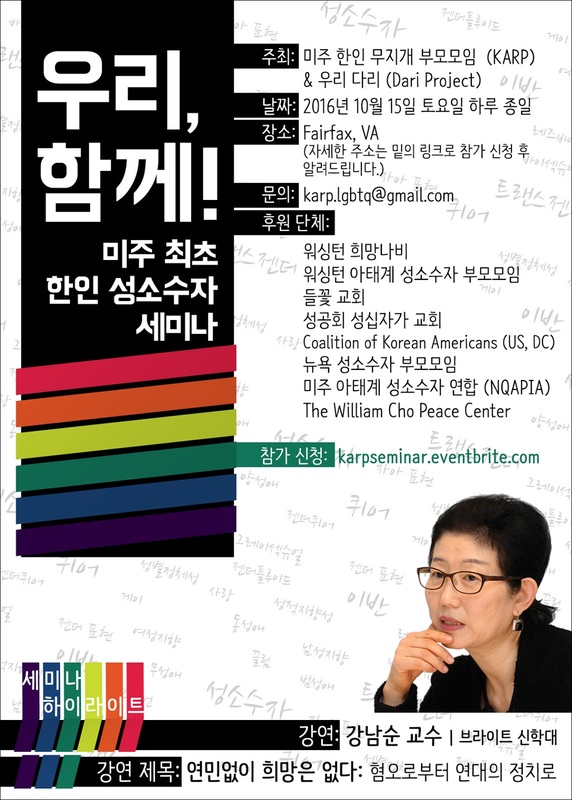 The event will be conducted in Korean -- with English interpretation available -- to help create a comfortable space for the Korean immigrant parents who are attending. For many of them, this will be their first time meeting other parents who have also made the choice to affirm and support their LGBTQ children, even despite their fears of societal and cultural judgment. The day will include small group discussions, a film screening, a keynote lecture from Professor Namsoon Kang of Brite Divinity School, a family acceptance workshop and shared meals for everyone to get to know one another. Please help spread the word -- to family, friends, friends of friends and beyond -- and help us solidify our fledgling movement for LGBTQ solidarity and pride within the Korean and Korean American communities. If you'd like to attend, you can register here. Consider supporting our efforts here. We have a long way to go, but our team -- a small group of dedicated parents and LGBTQ people with links to New York, D.C., Chicago, Seattle, San Francisco and L.A. -- is tireless. I am so grateful that my son stuck with us through the bad and the ugly as my husband and I struggled to understand him for more than a year after he came out. Even as a teenager, he had the courage to seek his own happiness in life and the strength to communicate that to others -- something I wasn't able to do even in my early 40s. As I help plan the first-ever Korean American LGBTQ Seminar, I cannot help but realize that I owe everything to my son: he has inspired and continues to empower me as I define and seek my own happiness in life. Thank you, my son. I love you unconditionally. 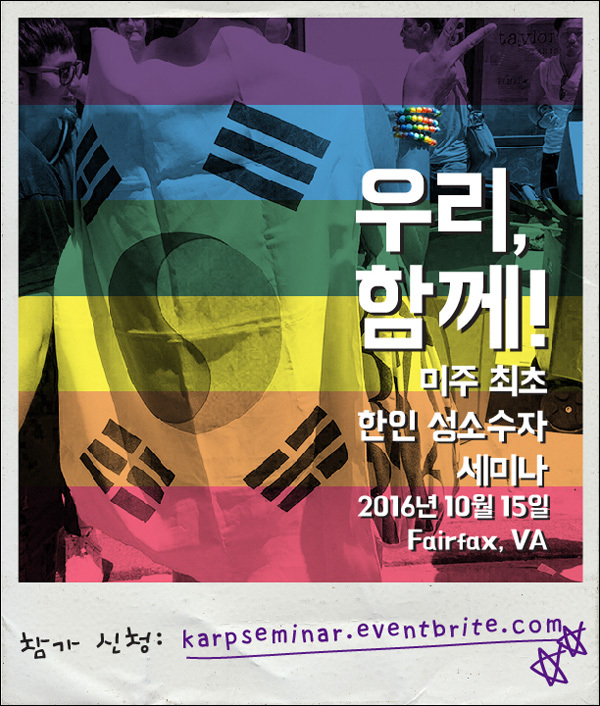 Korean American Rainbow Parents (KARP) aims to build compassion on queer issues within the Korean American community, on behalf of our LGBTQ loved ones.